RENO, Nev. – Over the past couple of weeks, Colt Oder has experienced the highs and lows of freestyle bullfighting. 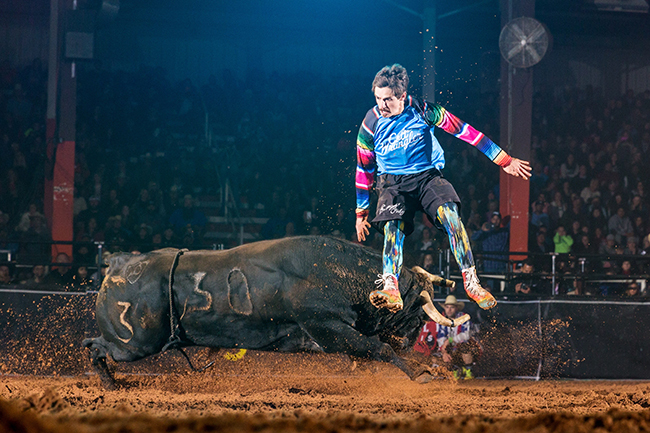 He got tangled up with Rockin’ B & Magnifica’s Mexicano at the Bullfighters Only Wrangler Bullfight stop in Decatur, Texas, resulting in a concussion and six stitches. “I was a little too aggressive,” said Oder, who rebounded a week later, posting an 83-point fight to win the Wrangler Bullfights Tour event at Crosby, Texas. “I didn’t give myself a shot. I should have gone slower and read my bull better. Oder will be taking part in the BFO Wrangler Bullfights that will be part of the Reno Rodeo, one of the most storied events in ProRodeo. He’ll be one of six men battling in the four-day championship. The event takes place June 19-22 – one of the first big stops through the summer run of rodeos. He’ll have that chance. The contestants make up a who’s who of the top names in freestyle bullfighting: two-time reigning world champion Weston Rutkowski, top-ranked Toby Inman, second-ranked Kris Furr, Beau Schueth and Justin Josey. In fact, the Reno field features six of the top seven bullfighters in the Pendleton Whisky World Standings. Josey won the recent BFO stop in Moose Jaw, Saskatchewan, on June 9. He’s already had a couple of big victories this year. In addition to winning north of the border, the Apache, Okla., man also won the Bullfighters Only stop in San Angelo, Texas, in February. The dangerous game of freestyle bullfighting comes with a price. Toby Inman, who finished second in the 2017 season, suffered a cracked rib in Decatur, then was knocked unconscious in Crosby. Ely Sharkey was also knocked out, but only after securing his first BFO victory in Decatur. “For me, it’s just cool to compete against guys like Weston and Toby, because they’re the very best,” Josey said. “When you beat the top guys in the game, it just feels better. You have to step up your game to win at this level.